Upgrade Slot 3 provides Huanghe with the ability to specialize in certain roles. AA Guns Modification 2 is the best choice for players wishing to specialize in anti-aircraft duties. 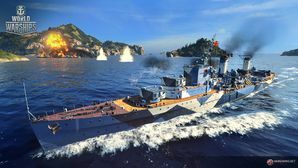 Aiming Systems Modification 1 ( ) is a generally viable choice which reduces the dispersion of main battery shells, increases torpedo traverse speed, and slightly improves the range and dispersion of the secondary battery. Players considering alternative builds may choose to equip Secondary Battery Modification 2 ( ) to increase the ship's firepower in close-quarter engagements. This slot also allows players to mount Smoke Generator Modification 1 ( ), a special upgrade which increases the action time of the Smoke Generator ( ) consumable. This upgrade is extremely useful and is highly recommended.